We are attempting to downsize our breeding program due to time constraints. Our loss is your gain! Most of the below listings are linked to the horse's individual page where you will find more information and photos of the horse. Horses listed for sale below not having links to individual pages will have information and photos added shortly. In the meantime, if you are interested in any of our horses listed for sale without current photos or information available on our site, please email us and we will be glad to forward you information and photos. We accept . Click here to pay via PayPal. 2007 filly. This baby's page and photos will be available soon. In the meantime, please contact us if you would like more information and/or photos. 2007 gelding. This baby's page and photos will be available soon. In the meantime, please contact us if you would like more information and/or photos. 2006 filly. This baby's page and photos will be available soon. In the meantime, please contact us if you would like more information and/or photos. 2005 Bay filly. Nice to look at and quick on her feet, with the breeding and talent she's showing she should make a nice cutter. 2005 Sorrel filly. This one is the one to get your hands on before she gets too old. She's got the performance record on both top and bottom side and she's bound to follow her parents and go show and win some money. Nice built and quick on her feet. 2005 Bay colt. This one has it all; a sweepy trot, deep lope and a natural headset. Super good legged and should make it big in the HUS pen. 2005 Sorrel colt. His dam always throws us nice colts and this one is just as good or better than her others. This one will be right up there for some serious futurity money someday. Built nice. 2004 Sorrel filly. Her mom throws some good ones and we're excited to have our other stud crossed with her to produce this nice filly. Going to make a good one. Has been saddled about 15 times and is coming along pretty nice with ground work. She'll go when you ask her, but she always comes right back down nice and calmly. This one is looking to have the potential to be winning some serious money someday. Update: 15 rides - walking and trotting. 2004 Bay filly. This filly is going to turn heads no matter where you take her. She's nice looking and has the talent we all want. This one is definite show potential and then can go on into any direction you point her. Has been saddled about 15 times and just gets better every time we saddle her. Update: 15 rides - walking and trotting. 2004 Sorrel stud. This guy should make some money in the cow horse and reining pen. Moves like a cat and is so quick about his feet. We left him a stud until the trainer can decide what lies ahead for this guy. Stallion or a gelding this guy will be a good one. 2003 Buckskin filly. This mare should make it at the buckskin shows in the cow horse and reining. Really nice colored and a super quiet mare. She's coming along real nice under saddle, started on lead changes and adding a little speed to the spins. Can sell with a breeding back to San Hollys Tangy Gin. 1998 Chestnut mare. Daughter of Dee Colonel on top and bred Mr. San Peppy on the bottom. Broke to ride, but we've just been using her as a broodmare. This mare really throws the good ones and is bred really well. We just want to cut back on mares and unfortunately this one is offered for sale. Bred back to San Hollys Tangy Gin for 2006. 1997 Sorrel mare. Driftwood Ike, Orphan Drift, Eddie Eighty bred. Sells open or with a breeding to stallion of your choice. Dam of some of our nicer babies (Socks, Twister, and others). Nice looking mare and throws some even better babies. She's a super athletic and fun mare to ride. She would be an outstanding addition as a broodmare to get some good looking, athletic ranch horses. 1993 Chestnut mare. Skipetta Chex is a finished reining horse and has been in the AQHA World Show - she has been broodmare but she is a wonderful youth 4-H horse at this time. She's been to the NRHA futurity under Randy Cutbirth's guidance. Bred to San Hollys Tangy Gin for 2006. 1998 Sorrel mare. Zippo Pine Bar and Leaguers Sandman bred. We've been crossing this mare to our cow horse studs and been getting some super nice ranch horses. This mare could be right at home in a western pleasure setting too. There's no reason this mare can't be broke to ride, we just haven't had time for her. She's bred back to San Hollys Tangy Gin for 2006. 2000 Bay mare. Super nice looking mare, has the look and she throws it right on to her babies. Her first foal in 2005 was awesome so we bred her back the same way for 2006. Bred back to Only Blue Sky for 2006. 1999 Gray mare. Sire Kotas Sandy Man - Reserve Buckskin Worlds Champion in Reining). This mare is all foundation, but looks so modern. Stands right around 16 hands and has the look of a hunter bred horse. We bred her to Only Blue Sky for a 2005 foal and got a nice gray stud colt. We left her open this year due to a late foaling. We can sell her with a breeding back to either of our studs for a baby in 2007. 1995 brown stallion (currently Standing at Stud) See his Pedigree. We call Ote Chex, Charlie! He is a 15-hand, chocolate brown stallion. We purchased him from Dr. Mark Arns. Dr. Arns was the Equine Department Director for Kansas State University. He is now the Equine Director for the State of Arizona - Tucson. Dr. Arns purchased Charlie because of his specialization in equine conformation and artificial insemination. He began using him as a breeding stallion in 1999, ending his show career. We have been so pleased to work with this gentleman. He is an obedient, respectful partner. At March 2005, we have had 52 foals from him and they are athletic, gentle, trusting and bright! 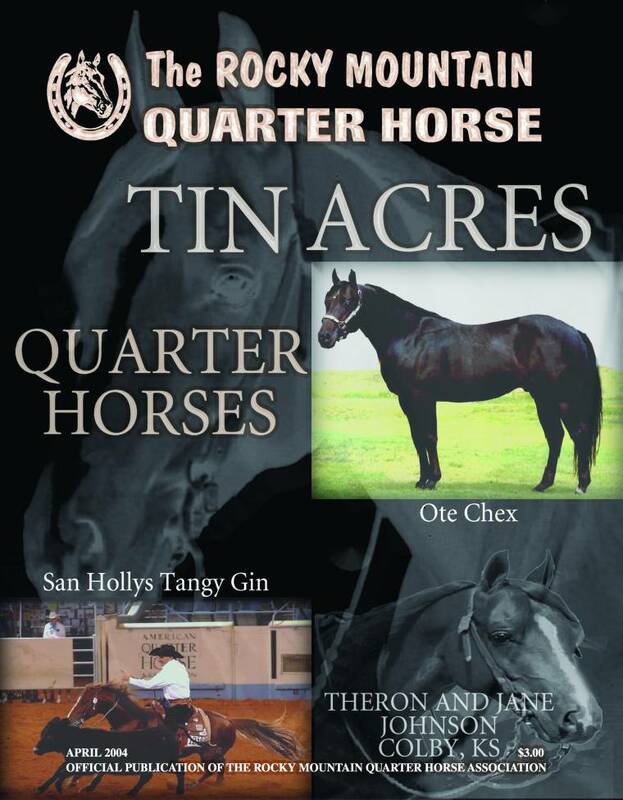 Our son, Josh, designed a layout featuring Ote Chex as well as another of our horses (San Hollys Tangy Gin) which was published on the front cover of The Rocky Mountain Quarter Horse Magazine April 2004 edition. (See the layout to the left of this area - we think it's awesome (if we do say so ourselves) !